A Mandarin-language theater production of “The Lion King” premiered June 14 at the newly-opened Shanghai Disneyland, the first of its kind to be performed in mainland China. While “The Lion King” is a Broadway staple, having been shown to over 80 million people since its premiere in 1997, the Chinese audience received an altered version. A combination of eastern and western aesthetic elements are reflected in the score, and props. The producers even took the liberty of including the Monkey King of ancient Chinese literature. Seeing photos of the event posted to Chinese social media sites, netizens had mixed reactions to the show. Many criticized the modifications made to the Disney classic as tacky, misplaced, or even deceiving. 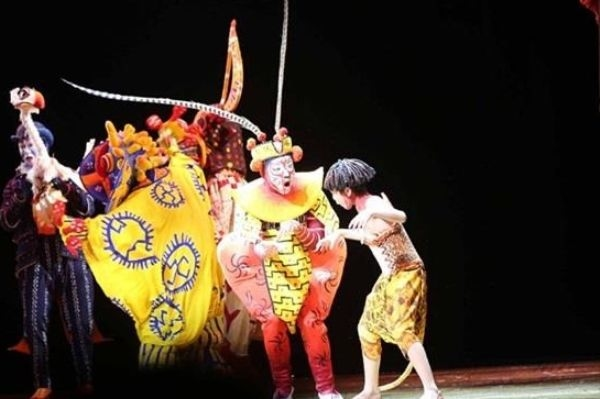 Some humorously called the production “a path of development for Lion King with Chinese characteristics,” echoing the Communist Party’s explanation of its own use of capitalist policies. Others were more openly critical: “My childhood fantasy was ruined,” one comment reads. The hyena antagonists of the story, which remains more or less faithful to the Broadway production, speak with a strong Northeast Mandarin accent, which some found jarring, with descriptions of “neither fish nor fowl” or “what kind of Disney is this?” from social media comments. “Since it’s Shanghai, shouldn’t they speak the Shanghainese dialect?” one rhetorically asks. It’s not the first time that western shows in China have been infused with Chinese cultural elements to controversial effect. In 2011, a Mandarin version of “Mamma Mia” showed in Shanghai, but with local dance movements and dialogue featuring regional dialects. In cinema, western film producers trying to break into the Chinese market often add scenes showing China or Chinese culture to get approval from official censors.